Beef, Spinach and Mushroom Strudel - Bake.Eat.Repeat. An easy appetizer, this beef, spinach and mushroom strudel is made with puff pastry and everyone will love it. 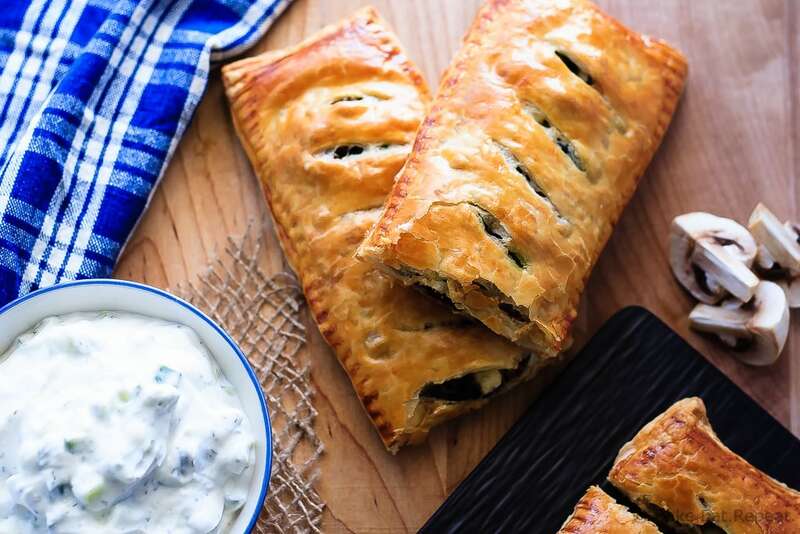 A savoury strudel filled with ground beef, mushrooms, spinach and feta cheese and served with tzatziki dip – perfect for appetizer night! We love appetizers around here. Whenever we go out to eat, it’s always a bit of a dilemma, because we have a hard time deciding between actual meals or a few appetizers to split. More often then not we go for the appetizers. It’s just so much better to get to try a few different things all in one meal! So it’s no surprise that we also love to do appetizer nights at home. A little more effort I suppose, but just as fun! We’ll often stick to the tried and true favourites when we’re in the mood for an appetizer night – like these Crispy Oven Baked Wings, or these Pretzel Bites, or plain old nachos. This beef, spinach and mushroom strudel is amazing. I mentioned last week that I’m a bit of a tzatziki nut? Well, I wasn’t joking – I already have something else for you that involves tzatziki. Couldn’t even wait a couple of weeks to share it. That’s okay though, because you all listened to my ramblings and made extra tzatziki like I said to since it’s so awesome. Right? If not, no worries, because it takes about 2.3 seconds to whip up. 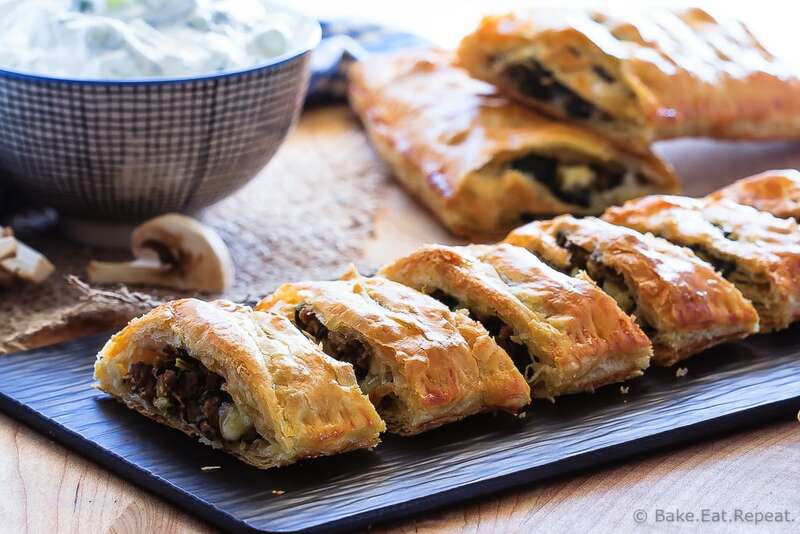 And it is the perfect accompaniment to this savoury mushroom strudel filled with ground beef, mushrooms, spinach and feta cheese. Anyone up for an appetizer night? Because it’s way more fun then a regular meal. 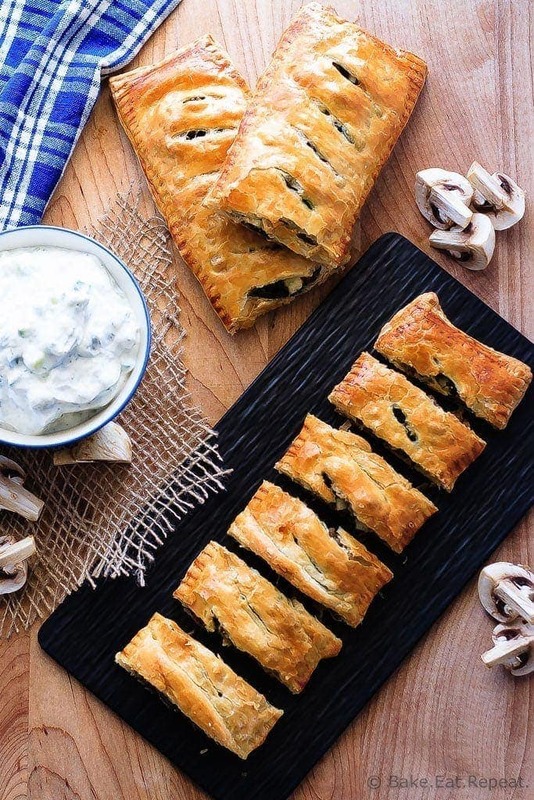 An easy appetizer everyone will love - this mushroom strudel is filled with ground beef, mushrooms, spinach and feta cheese, and served with tzatziki dip. In a large, non-stick skillet over medium heat, brown the ground beef. Drain the grease and add the onion, garlic, mushroom, oregano, pepper and salt. Cook, stirring for 2-3 minutes until the vegetables have softened. Stir in the spinach and feta and cook for another 1-2 minutes. Remove from the heat. On a lightly floured surface, unroll the two sheets of puff pastry. Cut each piece into three long, equal strips. Lightly roll each out a bit thinner with a rolling pin. Place three of the pieces onto a parchment lined cookie sheet. Divide the filling between the pieces of pastry, leaving a half inch space around the edges. Place another strip of pastry over top of the filling and press the edges to seal them. Crimp the edges with a lightly floured fork and cut slits into the top of the pastry to vent it. In a small bowl, whisk together the egg and water and lightly brush the three pastries with the egg wash. Bake for 25-30 minutes until the pastry is golden. Serve warm with tzatziki sauce. To make the tzatziki sauce, stir together the yogurt, cucumber, garlic and dill until combined and refrigerate until ready to use.